Photosynthesis occurs in the chloroplast of plant cells, algae, and some bacteria. Photosynthesis is the process by which autotrophic organisms use the sun's energy, water, and carbon dioxide to produce carbohydrates and oxygen. The process can be broken down into two parts: The Light-Dependent reactions (or Light Reactions), and the Light-Independent Reactions (also known as the Dark Reactions or Calvin Cycle). 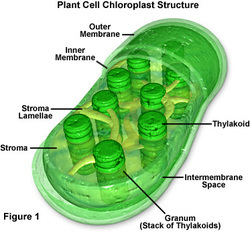 The Light Reactions take place in the thylakoid membrane and the Dark Reactions take place in the stroma of the chloroplast. The light reactions use energy from the sun to produce energy for the Calvin Cycle to produce carbohydrates. Photosystem II is excited by electrons which are passed along an electron transport chain in the thylakoid membrane to break down water. Water is broken down into protons, which build up in high concentrations inside the thylakoid, electons, which replenish the electron transport chain, and oxygen which diffuses out of the plant into the atmosphere. The protons diffuse out of the thylakoid down the concentration gradient through the enzyme ATP Synthase. This movement of molecules results in the creation of ATP from ADP and Phosphate ions. Photosystem I is excited by light energy and electrons are passed down a second electron transport chain to create NADPH. The ATP and NADPH produced in the light reaction are the energy sources used in the Calvin Cycle for carbon fixation to make glucose. The Calvin Cyle, or Dark Reactions, uses the energy created from the Light Reactions to make glucose. Carbon dioxide is fixed to a 5-carbon molecule, Ribulose BisPhosphate, to create an unstable 6-carbon compound, which promptly deteriorates into two 3-carbon molecules. The energy from ATP and NADPH are used to bind the 3-carbon compound to create glucose and additional Ribulose BisPhosphate which allows the cycle to repeat. The cycle must repeat several times to produce glucose, as only one carbon from carbon dioxide each cycle. Cellular Respiration takes place in the mitochondria of heterotrophs and autotrophs. Cellular respiration is the process by which cells make energy in the form of ATP (Adenosine TriPhosphate) by breaking down carbohydrates. Both heterotrophs and autotrophs carry out cellular respiration. ***Notice that the products of cellular respiration are the reactants of photosynthesis and vice versa! Cellular respiration is divided into two main stages: Glycolysis and Aerobic Respiration. Glycolysis is a biochemical pathway that is catalyzed by specific enzymes in the cytoplasm. The process starts with glucose and produces two molecules of pyruvic acid, two molecules of ATP, and two molecules of NADH, which is another energy-storing molecule. ...but there are other pathway options. If oxygen is present, pyruvic acid enters the process of Aerobic Respiration. If not, the pyruvic acid will be used in a process called fermentation, which is not very efficient, but allows the production of ATP to continue. In eukaryotic cells, Aerobic Respiration occurs in the mitochondria, which have a special internal structure. There are folded inner membranes, called Cristae, and a fluid inside, called Matrix. Aerobic Respiration has two major stages of its own: the Krebs Cycle and the Electron Transport Chain. The Krebs Cycle is a biochemical pathway which starts with a molecule called Acetyl CoA, which was made from pyruvic acid. The products are CO2 and, Hydrogen atoms, ATP, NADH, and another energy-storing compound called called FADH2. The Krebs Cycle occurs in the fluid matrix. The electrons of the two energy storing molecules produced during the Krebs cycle, NADH and FADH2, are used in the electron transport chain to produce a lot of molecules of ATP, the main energy source of a cell. 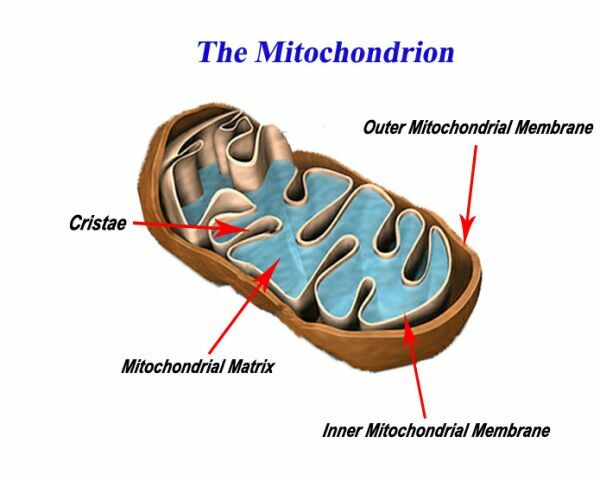 The Electron transport chain occurs in the cristae of the mitochondria. Oxygen is the final acceptor of protons and electrons. Together these particles form two molecules of water. Like in the light reaction, a proton gradient is built up inside the mitochondria, which creates ATP as the protons move down the concentration gradient through the enzyme ATP Synthase. Glycolysis forms 2 molecules of ATP and 2 molecules of NADH. When pyruvic acid is converted to acetyl CoA, 2 molecules of NADH are produced. The Krebs Cycle produces 2 molecules of ATP, 6 molecules of NADH, and 2 molecules of FADH2. Each NADH produces 3 molecules of ATP. Each FADH2 produces 2 molecules of ATP. The total number of molecules produced is 38! That's a lot of ATP!